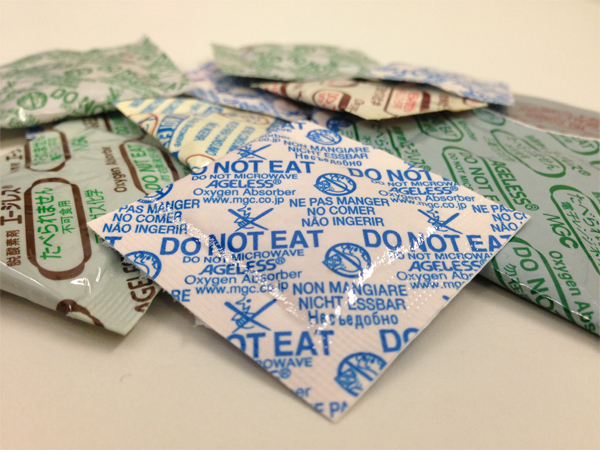 An oxygen absorber is a small sachet used to keep products safe from things like mold and extend shelf life by taking the oxygen out of a sealed package. These oxygen absorbers can be found in many different types of things from pharmaceuticals to industrial metals, but probably the most common use for them is with food. Also known as an oxygen scavenger, these sachets are tools that help to keep products fresh without all the unhealthy preservatives. “But there are a lot of foods I eat that don’t have oxygen absorbers in them that don’t ever seem to spoil.” This is because there are many foods in the market today that use preservatives to extend shelf life as long as possible. This may sound like a good thing, but these foods cannot be considered organic or natural. By using oxygen absorbers, companies can reduce the amount of preservatives they are using to provide fresh and organic goods to their consumers. “Something that is manufactured to absorb oxygen can’t be safe to come in contact with food!” On the contrary, the safety of our oxygen absorbers have been fully FDA approved and are perfectly safe to come in contact with any variety of foods and pharmaceuticals. Their primary function is to enhance the shelf life of products and prevent the negative effects of oxidation, all while the ingredients are hermetically sealed inside food friendly packaging. “I opened an oxygen absorber once and there’s black powder inside.” The black powder inside is iron. When the iron powder comes into contact with oxygen, it begins to absorb it and the iron becomes oxidized instead of the product. That is how an oxygen-less state is achieved inside a package. If the packet does happen to open for some reason, there is no need to worry. After rigorous toxicology testing, the contents of our food grade oxygen absorbers are FDA approved and have been found to be safe. While all oxygen absorbers are not made equal, a good oxygen absorber is a safe and reliable alternative to many less harmful forms of preservation for any number of high quality products.